Small children with airway obstruction breathe with very low tidal volumes (VT) and high respiratory rates (RRs). These extreme respiratory patterns affect drug delivery unpredictably through valved holding chambers (VHCs). We compared in an in vitro study the effectiveness of two VHCs, one small (140 mL, Optichamber Diamond) and one large (350 mL, Babyhaler) without facemasks, to deliver salbutamol to filters positioned between the VHC mouthpieces and a breathing simulator. 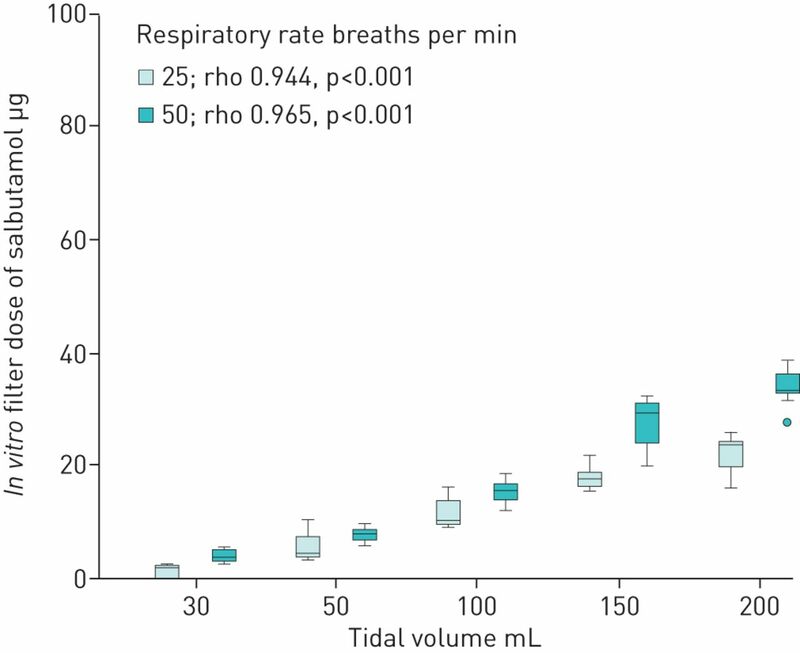 Different tidal volumes (from 30 mL to 200 mL) and RRs (25·min-1 and 50·min-1) were applied through a breathing simulator. The amount of salbutamol delivered increased with increasing VT in both VHCs for both RRs (ρ>0.87 and p<0.001 for both devices at both rates). The effect of RR was not as evident, but drug delivery tended to be higher at the higher rate. Drug delivery was significantly higher through the Optichamber Diamond as compared with the Babyhaler at every combination of RR and VT up to a 12-fold difference. We found marked differences in salbutamol delivery between the Babyhaler and Optichamber Diamond VHCs. The delivered dose of salbutamol increased with increasing VT and RR with both VHCs but with differences related to valve dead spaces. Instead of considering all VHCs equal in clinical paediatric practice, each device should be tested in vitro with respiratory patterns relevant to small children with respiratory difficulties. Recurrent wheezing is most common before school age compared with any other age group . Furthermore, acute exacerbations of asthma account for approximately 10% of the emergency visits in children resulting in hospitalisation in 20–40% of cases . In young children, inhaled bronchodilators and corticosteroids are administered by pressurised metered dose inhalers (pMDIs). The use of valved holding chambers (VHCs) improves drug delivery and precludes the need for coordination of actuation and inhalation by holding the aerosol cloud to be released only during inhalation [3, 4]. There are numerous problems that physicians and caregivers encounter when treating small children with inhaled medication delivered through a pMDI connected to a VHC. The only possible inhalation technique in young children is tidal breathing. Infants and toddlers have highly variable tidal volumes (VT) and respiratory rates (RRs). Particularly in the acute setting during an asthma attack or breathing difficulty (when bronchodilators are most needed) it is not possible to instruct very young children on the correct breathing pattern for optimal drug delivery. Breath holding is not possible in most children below the age of 3 years. In addition, the drug delivery is greatly dependent on the pMDI and VHC combination used. As a consequence, the child's clinical response to inhaled medications might be very difficult to predict. The most important breathing parameters affecting the delivered dose of inhaled medications are RR, VT, the duty cycle (inspiratory proportion of the breathing cycle, tI/ttot), and the peak inspiratory flow rate (PIFR) that is determined by the three previous variables. Breathing pattern, VT, PIFR, and resting RR all change with growth and development [5, 6]. VT in the first years of life, is approximately 7–10 mL·kg−1 of ideal body weight . With increasing age, RR decreases (median breath·min−1 at <1 year is 37–44; 1–3 years is 25–38; 3–6 years is 22–26; and 6–12 years is 18–22 breath·min−1)  while VT increases. During bronchoconstriction, VT decreases and RR increases, compared with normal and asthmatic patients, have a higher range of variation in PIFR compared with healthy subjects . PIFR is linearly correlated with VT [5, 8] and drug delivery seems to increase with a rise in VT. Previous studies evaluating drug delivery by VHCs have mainly been done with inspiratory flow rates of 20–60 L·min−1, and only a few have used rates <10 L·min−1 [8–11]. However, low flow rates are clinically important, since children below school age can have inspiratory flow rates as low as 2 L·min−1. Also, the optimal number of breaths required to empty the VHC depends on the child's VT, the volume of the VHC and the valve dead space. Generally, 5–10 breaths are sufficient per actuation [3, 12]. Each VHC has its own unique features that are related to material, electrostatic and aerodynamic characteristics, volume, dead space, and valve design. The behaviour of an aerosolised drug depends on the VHC used [13, 14] and certain combinations of pMDI and VHC may result in drastic differences in dose output [3, 10, 12, 15, 16]. In addition, drug delivery is dependent on the patient population under investigation . Inhaled drug delivery studies should evaluate each VHC with the particular target population's breathing pattern during normal and obstructive conditions. There is a plethora of VHCs on the market with different material, design, volume, and overall characteristics. A significant proportion of published studies evaluating and comparing the efficacy of VHCs is funded by their manufacturers, causing a potential bias. In addition, only a handful of studies have addressed the issue of the breathing patterns of small children especially in obstructive conditions. In many countries, the most widely used VHC is the Babyhaler (BH) both in healthcare units and at home. BH also represents a large-volume VHC model that has been used for a number of years in the acute care of children. In contrast, the Optichamber Diamond (OD) represents a new type of VHC made of nonconducting plastic with a relatively small valve dead space and small overall volume. We used an in vitro setup with a filter interposed between the VHC and breathing simulator. This allows multiple measurements to be performed reproducibly minimising confounding factors and focussing on those parameters that are related specifically to the VHCs. Face masks were excluded from this study for the same reason. The main aims of this study were to 1) assess whether there are clinically significant advantages of a newer and smaller type of VHC compared with an older and larger VHC and 2) to evaluate the effects of VT and RR on drug delivery from a pMDI using VT and RRs that are relevant to small children with respiratory difficulties. Delivery of salbutamol sulfate generated by a pMDI (Ventoline Evohaler 1 mg·mL−1, Glaxo Wellcome Production, Evreux, France) was measured through a small volume (140 mL OD, Philips Respironics, UK) and a large-volume (350 mL BH, GlaxoSmithKline, USA) plastic VHC. Three separate devices from different manufacturing lots were used for both VHCs. Prior to measurements all the VHC components were immersed in lukewarm water with detergent (Fairy Liquid; Proctor & Gamble, Harrogate, UK), rinsed under running tap water, and left to air dry vertically. A filter (PARI Respiratory Equipment, Inc., USA) was placed in a low-dead-space (10 mL) filter holder and connected between the VHC mouth piece and the breathing simulator (Sinus Breathing Simulator; PARI, Starnberg, Germany) (figure 1). The simulator produced alternating inspirations and expirations with sinusoidal wave and a duty cycle (inspiratory proportion of the breathing cycle) of 0.5. The accuracy of the breathing simulator was validated by a Fluke VT305 Gas Flow Analyzer (Fluke Biomedical, USA). Test rig. The filter was placed in a filter holder and connected between the valved holding chamber mouth piece and the breathing simulator. We used two different RRs (25 min−1 and 50 min−1) and five different VT (30 mL, 50 mL, 100 mL, 150 mL and 200 mL). The corresponding minute ventilations with mean and peak inspiratory flows at each VT and RR are presented in table 1. At each combination of RR and VT, Ventolin was actuated and salbutamol output was measured on three replications using each of three separate devices of both BH and OD. Thus, nine measurements of salbutamol output at each combination of RR and VT are used in the results. Before each measurement sequence, pMDIs were primed by actuating those five times to waste. Before every actuation the pMDI was shaken vigorously five times. The pMDI was then inserted into the VHC and actuated once immediately at the start of inhalation. Salbutamol was left to accumulate into the filter for eight breathing cycles. The filters were sealed until analysis with Parafilm M (Bemis Company, Inc., Oshkosh, WI, USA). Drug particles deposited on the filters at each measurement protocol were recovered and analysed by high-performance liquid chromatography (HPLC) carried out by Emmace Consulting AB (Lund, Sweden). The HPLC method was based on an internal standard methodology and the limit of quantitation (LOQ) was determined as the peak height corresponding to 10 times the noise level. The LOQ was 2 µg. The HPLC system (Agilent 1100) was fitted with the appropriate column (Symmetry (Waters), C18, 5 µm, 50×3.9 mm2). Bracketing standards were made up and run, and the accuracy of the standards was checked. Standards were injected through the run at least six times. The percentage relative standard deviation of bracketing standards was <2% throughout the run with excellent linearity (y=0.0021x, R2=0.9998). No formal sample size calculation was performed. On the basis of previous studies, it was anticipated that nine measurements for each setting (altogether 20 different combinations) would allow the detection of possible significant differences. The data were not assumed to be normally distributed. In vitro filter dose values are reported as means, medians and minimum and maximum values. To test for the difference in in vitro filter dose between the VHCs or between different RRs, we used the Mann–Whitney U-test. To assess the correlation between VT and in vitro filter dose we used the Spearman rank correlation. The software IBM SPSS Statistics for Windows, version 24 (IBM Corp, Armonk, NY, USA) was used for the data analysis. There was a strong and statistically significant correlation between VT and in vitro filter dose of salbutamol with both VHCs at both RRs (figures 2 and 3). The amount of salbutamol available for inhalation increased almost linearly with VT. For BH (VHC volume 350 mL) the Spearman rank correlation coefficients were 0.944 (p<0.001) and 0.965 (p<0.001) at RRs of 25·min−1 and 50·min−1 respectively. For OD (VHC volume 140 mL) the Spearman rank correlation coefficients were 0.893 (p<0.001) at both RRs (25 min−1 and 50 min−1). In vitro filter dose of salbutamol with large valved holding chamber, Babyhaler (volume 350 mL). Respiratory rate of 25 min−1 and 50 min−1 and tidal volume from 30 to 200 mL. Rho: Spearman's rank correlation coefficient. In vitro filter dose of salbutamol with small valved holding chamber, Optichamber Diamond (volume 140 mL). Respiratory rate of 25 min−1 and 50 min−1 and tidal volume from 30 to 200 mL. Rho: Spearman's rank correlation coefficient. The median dose of salbutamol recovered was significantly lower at a RR of 25 min−1 compared with a RR of 50 min−1 except for OD at a VT of 30 mL and 200 mL and for BH at a VT of 50 mL. The lowest median amount of drug available for inhalation was 1.5 µg for BH with the breathing pattern of RR at 25 min−1 and VT of 30 mL. The highest median amount of drug available for inhalation was 57.7 µg for OD with a RR of 50 min−1 and VT of 200 mL. Both VHCs showed a 2–3-fold range difference between the minimum and maximum dose output (table 2). With a RR of 25 min−1 and the lowest VT of 30 mL there was an approximately 12-fold difference in median salbutamol doses between BH and OD (1.5 µg versus 18.5 µg; p=0.002). With a higher VT the difference between VHCs was smaller but remained significant at all VT values and both RRs (table 2). In this study we have demonstrated in a simulation model that breathing pattern has a significant effect on β2-agonist drug delivery from VHCs. Although the amount of salbutamol recovered from the filter increased with RRs and VT values in both VHCs, there was a marked difference between the two devices investigated. Compared with OD, the salbutamol output of BH was significantly lower with all breathing patterns. When BH was used at a VT of 30 mL and a RR of 25·min−1 the salbutamol amount in the filter was practically zero. There was a 2 to 12-fold difference of delivered dose between BH and OD, favouring OD with every breathing arrangement. Since each age group has its own breathing pattern (and the breathing pattern is also different if the child has bronchial obstruction) it is essential to evaluate drug delivery for each target group. Our study gives important information with clinical implications about a patient group that is challenging to treat. Children below school age have very low respiratory flow rates compared with older children and adults, although in some specific conditions children might have higher VT values than previously thought . We used respiratory patterns that represent children younger than 7 years [5–7]. 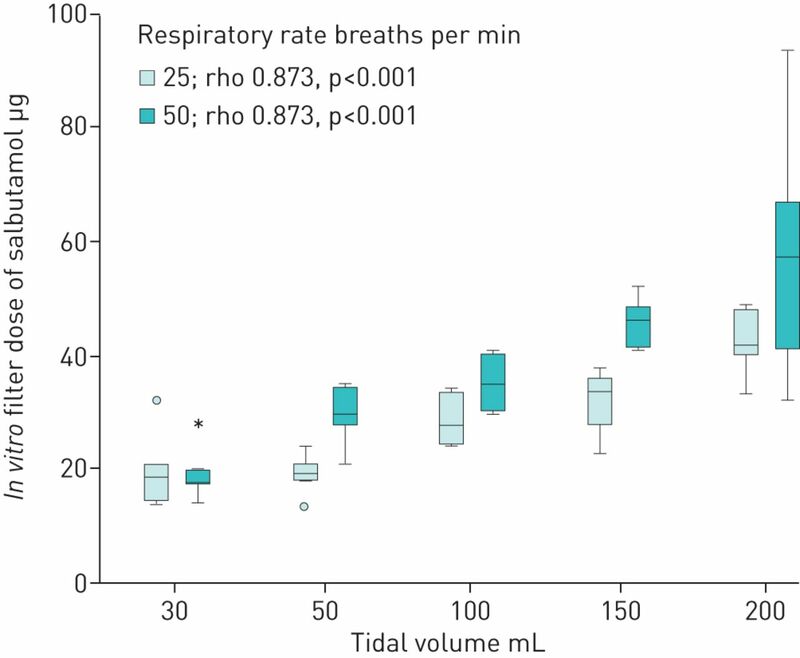 For example, with a RR of 25 min−1 and a VT of 100 mL, minute ventilation is as low as 2.5 L·min−1 and sinusoidal approximation of the breathing profile gives estimates for the mean inspiratory flow rate of 5.0 L·min−1 and PIFR of 7.9 L·min−1. Previous publications have mainly focussed on VT values >150 mL and flow rates of 20–60 L·min−1. Inspiratory flow rates <10 L·min−1 were only used in some studies [8, 10, 11]. By age, minute ventilation is increasing due to overall growth and development (increased height, lung volume, and alveolar surface area). However, the increase in Vt is not fully revoked by simultaneous decreases in RR. Therefore, it is likely that in older children, the resting tidal breathing leads to better deposition through a VHC compared with infants and toddlers. As the VT and RR rises, the aerosol speed increases and there is less time for the particles to precipitate inside the VHC. Previous studies also described inhalation volume and flow dependence of drug delivery through VHCs [8, 19, 20–22]. Chavez et al. found that gradually increasing the VT from 36 to 290 mL, the filter dose of albuterol increased in a logarithmic fashion with both RRs of 12 and 24 L·min−1. Mitchell et al. observed marked differences on the effect of breathing patterns between three VHC designs (Space Chamber, Vent-170 and Child AeroChamber). For example, with a VT of 50 mL and a RR of 30 min−1, one of the VHCs yielded undetectable levels of salbutamol compared with a 37-µg filter dose from another device. In our measurements, to collect the drug deposited on the filter, we used eight breathing cycles. In some studies it was shown that even two cycles was sufficient for reliable collection. However, we wanted to make sure that the VHC was emptied even using breathing patterns of children under 2 years of age with a low VT. We used a tI/ttot of 0.5. The tI/ttot is independent of age and varies between 0.3 and 0.5 . Since all measurements were done with the same duty cycle, this parameter does not affect the observed difference between devices. To minimise the effect of static charge all VHCs were prewashed with detergent and air dried before use [3, 19, 23, 24]. Despite standardised and well-controlled conditions, we found a marked difference in the performance of the two devices used. VHCs on the market differ in volume, shape, material, valve mechanism and overall design, all of which can influence the aerosol distribution, precipitation pattern, and drug delivery in an unpredictable fashion [22, 25]. For example, it has been speculated that in a larger volume VHC, aerosol concentration and particle impaction is less than in smaller volume VHCs, which results in lower inhaled doses at a small VT but higher doses when the VHC can be emptied faster with a larger VT. The relatively large dead space in the BH (40 mL) and suboptimal valve function can partly explain the low VHC output at a small VT [12, 21, 22]. It is not entirely clear why BH performed poorly compared with OD. A recent meta-analysis concluded that VHCs are as effective as nebulisers in relieving acute bronchoconstriction with bronchodilators . However, this review did not include children under the age of 2 years with a low VT. In addition, two of the three studies using BH favoured nebulisers in contrast with the overall conclusion of the review. The results of such meta-analyses cannot be generalised to consider all VHCs as equal for small children in the need of acute inhaled asthma medication. Hence, different VHCs should not be considered to be interchangeable . The dose response to β2-agonists is relatively shallow [28, 29]. In stable asthma, having a lower respirable salbutamol dose available may have little consequences. However, in acute settings the observed degree of drug delivery differences may have serious consequences. This magnitude of performance variability implies the potential for clinically relevant differences when salbutamol and other inhaled medication are administered via VHCs. One might argue that by increasing the administered doses one could obtain the desired therapeutic effect. However, increasing the dose will not necessarily increase the delivered dose linearly. In addition, this approach is not cost-effective and may increase the risk of side effects. For this reason, it is a high priority to test each VHC in the intended target population with each type of pMDI. We used RRs and VT values representing small children in need of acute inhaled medications as the target population. The parameters were to mimic a real-life setting but in a well-controlled manner. Ideally, drug delivery should be quantified through the VHC as the patient would actually breathe. In vivo studies are indispensable; nevertheless in vitro measurements provide reproducibility when evaluating the effect of tidal breathing, flow, and when comparing different devices. Our methodology was limited to measuring in vitro total dose delivery. Correlation between in vitro and in vivo data and clinically relevant therapeutic effects is difficult to predict. VHC output generally increases with an increase in inhalation volume and flow  and reaches a plateau at around 30 L·min−1, depending on VHC dimensions . While lung dose also increases with VT, at some point the accelerated inspiratory flow can eventually have a negative effect on lung dose . We did not evaluate the amount of drug that potentially would have impacted on the oral cavity, pharynx and upper airways. Nonetheless, it could be speculated that with the flows we used the plateau of VHC output and in vivo lung deposition was not an issue. The therapeutic amount of drug reaching the lower airways is probably even smaller than detected on the filters. For this reason, the differences in devices and their capacity for drug delivery may be even more significant. We used a respiratory simulator that produced a sinusoidal form of respiratory cycle. Although VT values and RRs in our study were comparable with real-life settings, peak inspiratory flow probably differs from real breathing cycles where inspiratory proportion and curve shape differ from an experimental sinusoidal pattern. However, there is considerable variation in respiratory patterns between individuals especially during an acute respiratory distress and even variation between respiratory cycles in the same individual. Therefore, simulated models can never mimic real-life breathing patterns to the smallest detail. Part of the variation in our results may be due to the function of the pMDI itself (Ventolin Evohaler) and HPLC analysis method of the drug delivery. However, these factors affect each respiratory pattern and both VHCs tested similarly and cannot explain the detected differences in drug delivery between different breathing patterns and devices. In our financially independent in vitro study, we found a marked difference in salbutamol delivery between the two VHCs studied (BH and OD). The delivered filter dose of both VHCs increased with increasing VT and RR. BH performed especially poorly with a VT <150 mL. In small children with asthma exacerbation having a very low VT, there might be close to zero amount of the drug available for inhalation. When training physicians and caregivers, there should be more emphasis on how breathing patterns affect drug delivery and eventually the success of treatment when using VHCs in small children. Instead of considering all VHCs as equal, all combinations of pMDI+VHC should be systematically tested in order to establish the most effective and reliable combinations to be licensed for clinical practice. We would like to thank Jan Svedmyr (Paediatric Allergology, Children's Hospital Falun, Dalarna, Sweden) for his valuable collaboration and Mikael Csonka (University of Tampere, Finland) for his practical help. Conflict of interest: P. Csonka reports personal fees from ThermoFisher, ALK-Abello and OrionPharma, outside the submitted work. Conflict of interest: L. Lehtimäki reports personal fees from AstraZeneca, Boehringer Ingelheim, Chiesi, GSK, Mundipharma, Novartis, OrionPharma, Teva and ALK, outside the submitted work. Support statement: This study was supported by the Foundation of the Finnish Anti-Tuberculosis Association, Research Foundation of the Pulmonary Disease, Tampere Tuberculosis Foundation, and Väinö and Laina Kivi Foundation. Funding information for this article has been deposited with the Crossref Funder Registry. Age-related changes in childhood wheezing characteristics: a whole population study. Pediatr Pulmonol 2017; 52: 1250–1259. Corticosteroid therapy and need for hospital care in wheezing preschool children. Eur J Clin Pharmacol 2000; 56: 591–596. GINA. Global Strategy for Asthma Management and Prevention. 2018. http://ginasthma.org/2018-gina-report-global-strategy-for-asthma-management-and-prevention/ Date last accessed: October 1, 2018.
. Review of optimal characteristics of face-masks for valved holding chambers (VHCs). Pediatr Pulmonol 2008; 43: 268–274.
. Breathing patterns. Eur Respir Rev 2000; 10: 576–579.
. Optimizing aerosol delivery by pressurized metered-dose inhalers. Respir Care 2005; 50: 1191–1200. Normal ranges of heart rate and respiratory rate in children from birth to 18 years of age. Lancet 2011; 6736: 1011–1018. Validation of methodology for recording breathing and simulating drug delivery through spacers and valved holding chambers. J Aerosol Med Pulm Drug Deliv 2010; 23: 311–322. In vitro comparison of the effect of inhalation delay and flow rate on the emitted dose from three valved holding chambers. J Aerosol Med Pulm Drug Deliv 2014; 27: S-37–S-43.
. In vitro performance testing of three small volume-holding chambers under conditions that correspond with use by infants and small children. J Aerosol Med 1997; 10: 341–349.
. Effect of face mask dead volume, respiratory rate, and tidal volume on inhaled albuterol delivery. Pediatr Pulmonol 2010; 45: 224–229.
. In vitro performance of three combinations of spacers and pressurized metered dose inhalers for treatment in children. Eur Respir J 1998; 12: 472–476.
. In vitro comparison of the amount of salbutamol available for inhalation from different formulations used with different spacer devices. Eur Respir J 1997; 10: 1345–1348.
. In vitro comparison of beclomethasone and salbutamol metered-dose inhaler aerosols inhaled during pediatric tidal breathing from four valved holding chambers. Chest 1998; 114: 1676–1680. De Jong VM, et al. Aerosol delivery from spacers in wheezy infants: a daily life study. Eur Respir J 2000; 16: 850–856.
. Inhaled steroid delivery from small-volume holding. J Aerosol Med 2004; 17: 225–230. Spacer devices for inhaled therapy: why use them, and how? ERJ Open Res 2018; 4: 00065-2018. Aerosol inhalation from spacers and valved holding chambers requires few tidal breaths for children. Pediatrics 2010; 126: e1493–e1498. Washing plastic spacers in household detergent reduces electrostatic charge and greatly improves delivery. Eur Respir J 1999; 13: 673–678.
. The output of budesonide from spacer devices assessed under simulated breathing conditions. J Allergy Clin Immunol 1999; 104: 1205–1210. Determining factors of aerosol deposition for four pMDI-spacer combinations in an infant upper airway model. J Aerosol Med 2004; 17: 51–61.
. Drug delivery from holding chambers with attached facemask. Arch Dis Child 1992; 67: 580–585.
. Equivalence for spacers and valved holding chambers used with pressurized metered dose inhalers (pMDIs). J Aerosol Med Pulm Drug Deliv 2012; 25: 217–242. Effect of electrostatic charge, flow, delay and multiple actuations on the in vitro delivery of salbutamol from different small volume spacers for infants. Thorax 1996; 51: 985–988.
. Inhalational drug delivery from seven different spacer devices. Thorax 1996; 51: 835–840.
. Holding chambers versus nebulisers for beta-agonist treatment of acute asthma. Cochrane Database Syst Rev 2013; 9: 3–6. Are valved holding chambers (VHCs) interchangeable? An in vitro evaluation of VHC equivalence. Pulm Pharmacol Ther 2018; 48: 179–184. Cumulative and single-dose design to assess the bronchodilator effects of β2-agonists in individuals with asthma. Am J Respir Crit Care Med 2001; 163: 474–477. Population pharmacodynamic model of bronchodilator response to inhaled albuterol in children and adults with asthma. Chest 2008; 134: 981–989.